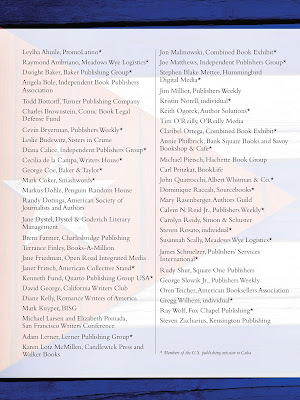 The American publishing community joined together today to call on the US Congress and President Obama to end the book embargo against Cuba. The Wall Street Journal and Publishers Weekly covered the story earlier today. On Monday, in an unprecedented show of support, Publishers Weekly will print the petition on the front cover of the magazine. You can see a preview of what it will look like at left. Over 45 companies, organizations, associations and individuals signed the Publishers Weekly petition, including the CEOs of three big 5 publishers. You can view the text of industry petition here. There's also a new, public petition at Whitehouse.gov. Add your support now by signing the public petition here. The American writing community is well-represented in the Publishers Weekly petition with backing from Romance Writers of America (RWA), Independent Book Publishers Association (IBPA), American Society of Journalists and Authors (ASJA), California Writers Club, Sisters in Crime, and the San Francisco Writers Conference. "Access to books and literature is a fundamental human right. It's for this reason the California Writers Club, an organization representing over 2,000 writers, is proud to sign this important petition to end the book embargo against Cuba." Among the publishers and distributors signing are the CEOs of Penguin Random House, Hachette Book Group, Simon & Schuster, Sourcebooks, O’Reilly Media, Kensington, Open Road Integrated Media, Smashwords, Independent Book Group (IPG) and Baker & Taylor. See the end of the blog post for the full petition and the signers. Americans - Sign the Petition Today! There are two petitions in this campaign. 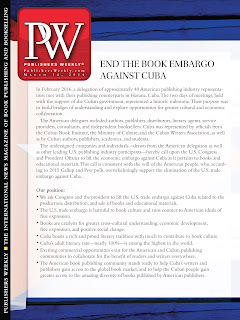 The first petition is the industry petition in which CEOs and top executives drawn from multiple sectors of the U.S. publishing community voiced their support for an end to the Cuban book embargo. This is the petition that will appear on the front of Publishers Weekly next week. The second petition is a petition for the American public. This petition, hosted at Whitehouse.gov, calls on President Obama to take immediate steps to eliminate the embargo as it pertains to books and educational materials. Please sign it and share the link to the petition with everyone you know. Tweet it, Facebook it, bang pots and pans for it! If we attract 100,000 signatures, the Obama administration will be obligated to issue a public response at the link above. 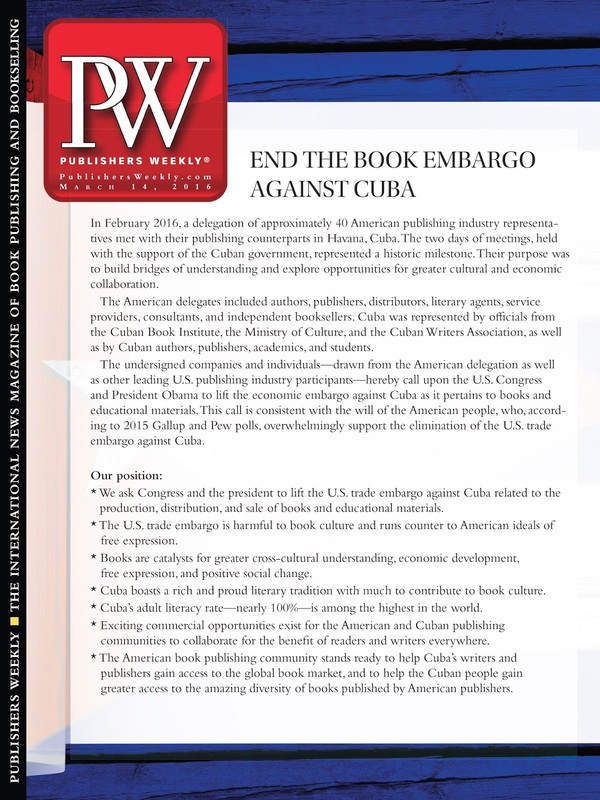 I conceived of the petition last month while visiting Cuba as part of 40 member publishing industry delegation organized by Publishers Weekly and Combined Book Exhibit. The delegation was organized by Publishers Weekly and Combined Book Exhibit. You can read about the delegation in the Publishers Weekly stories by Calvin Reid (here and here). Several days of meetings, held with the support of the Cuban government, represented an historic milestone. The purpose was to build bridges of understanding and explore opportunities for greater cultural and economic collaboration. The American delegates included authors, publishers, distributors, literary agents, service providers, consultants, and independent booksellers. Cuba was represented by officials from the Cuban Book Institute, the Ministry of Culture and the Cuban Writers Association, as well as Cuban authors, publishers, academics, and students. While listening to the Cuban authors and publishers, I was struck by how horribly harmful the embargo is to their authors, publishers and readers. Due to the US embargo, it’s extraordinarily expensive and difficult for Cuban publishers to gain access to even the simplest raw materials of bookmaking, such as paper and ink. And for self-published authors, even if they had access to self-publishing services or book printers, the set-up fees of such print services would be prohibitively expensive. Typical Cubans, whether they’re doctors or janitors, earn the equivalent of less than $20 US dollars per month. This means they don’t have a lot of disposable income to purchase books or publish books. Yet the Cuban people love books. I attended the Havana Book Fair where over the course of a few days hundreds of thousands of Cubans attended. I noticed that the audience skewed toward younger millennials. These kids and young adults are the future of Cuba. They’re bright, well-educated, eager to read more books and they're excited about the warming relations with the US. Cuba has an adult literacy rate that is nearly 100%. Compare that to the the US where adult literacy is only about 80%. Cuba has a rich literary heritage. They value books. Imagine the amazing stories locked between the minds and fingertips of the Cuban people, just waiting to be revealed to the world. This is why I created Smashwords. I want to help these writers and publishers overcome the artificial barriers that prevent their words from reaching reader eyeballs. Of the approximate 45 publishers in Cuba – all state sponsored and cash-starved – they don’t have access to US markets, or to the services and expertise of the American publishing community. If you think about it, much of the enabling infrastructure of global publishing flows through the US. It's where you'll find the major publishers, distributors, literary agents and the myriad other service providers involved in the production, distribution and sale of books and bookmaking technology. The technology and services of Smashwords, for example, could make it fast, free and easy for any Cuban writer or publisher to produce and distribute an ebook. We can provide Cuban writers access to the free tools to reach a global Spanish-language audience. Imagine how transformative even a few dollars in royalties would be to a Cuban writer’s life. For Cuban readers, I want to make our 60,000 free books available to them along with our 350,000 other low-cost ebooks. I want to make it possible for Cuban readers to digitally read the books of Cuban and other Spanish-language writers too. Yet the economic embargo prohibits us from helping writers, readers and publishers in Cuba. The embargo prevents our retailer and library partners from operating in Cuba. Financial restrictions prohibit our payment processor – PayPal – from paying authors and publishers in Cuba. PayPal tells me they want to do business in Cuba but they can’t until the financial transaction restrictions of the embargo are lifted. During our interactions with our Cuban counterparts, it quickly became clear that both sides of the delegation were eager to work with one another, but we all felt powerless to do so due to the embargo. So I started wondering what we could do to fix the problem. Obviously, the answer was to end the embargo. So the crazy idea I came up with was for members of our delegation to take steps to end the embargo. Surely, if the multi-billion-dollar US publishing industry could come together and voice their support for ending the embargo, politicians who are otherwise ignoring their citizen constituents would listen to their corporate constituents, right? Following the visit to Cuba, we formed a petition committee of Publishers Weekly (Jim Milliot, Cevin Breyerman, George Slowik, Jr., Calvin Reid) , Combined Book Exhibit (Jon Malinowski and Janet Fritsch) and Jim Azevedo and myself of Smashwords. Publishers Weekly immediately committed to put this on the front of the magazine. I drafted the original petition and then we collaborated to edit and refine it, and then we worked together to set the strategy for the petition. What you see to today is the result of an amazing collaborative effort by my fellow organizers and of course the participation of the petition signers, many of whom understand and appreciate the delicate political environment in the US today. Today, these petition signers made a bold statement that they will stand on the right side of history despite the many voices that seek to perpetuate the past injustices of the economic embargo. A big thanks to Jeffrey Trachtenberg and his editors at The Wall Street Journal who saw fit to give this story the attention it deserved. The Wall Street Journal story has elevated our effort to the attention of the broader American public. The American public now has the opportunity to apply friendly encouragement to their political representatives, challenging our country to stand on the right side of history by lifting the embargo. The US embargo against Cuba has a dark and twisted past. What we in America refer to today as the embargo (and what Cubans refer to as “the blockade”) grew out of a tangled spaghetti mess of presidential executive orders followed by Congressional actions and statutes, and followed by escalating retaliations and rhetoric on both sides. Books have been written on the origins and impacts of the embargo. I'll try to summarize in a few paragraphs. In a nutshell, much of the mess started in 1960 when President Eisenhower decided to cancel 700,000 tons of sugar imports from Cuba to the U.S. The Cuban government then responded by nationalizing American oil refineries without compensation (why do some of America’s biggest world blunders always come back to oil? ), and then we added an embargo, and then they became dependent upon Russia for oil and military stuff, and then there was the Cold War and the Cuban Missile Crisis in which the world our parents knew almost ended in a puff of radioactive dust, and then the US Bay of Pigs invasion (oops, sorry), etc etc. Along the way the US has criticized the Castro regime for human rights violations as if this is justification for maintaining the embargo. I don’t doubt such violations (I met a woman on my flight to Cuba whose brother was shot in the ‘60s for trying to escape Cuba), but really, isn’t this the pot calling the kettle black? The US government has been no angel in world affairs. Yeah, we deserve some respect for helping to save humanity from Nazi and Japanese tyranny in World War II. But before and after that we had our fair share of screw ups along the way, like Americans stealing America from the native American Indians, or the dark stain of slavery, or the Iran/Contra deal, or the CIA overthrow of multiple democratically elected governments, or for more contemporary examples just look at how our government allows its own people to be poisoned by lead in Flint just to save a few bucks, or how we allow big corporations to buy politicians, or how we continue to cozy up to autocrats and dictators in oil-rich countries (there's oil again!) who strip their citizens of basic human rights, or who behead bloggers for offending Allah or whatever. But I digress. I love America. We’re a wonderful country with wonderful people but we can be pretty clueless quite a bit of the time. In the case of Cuba, we’ve been stupid for about five decades. Innocent Cubans have suffered. It’s actually pretty amazing the Cuban people don’t hate Americans. Yet you meet with them and what you see are a bright and optimistic people who feel incredibly connected to us, and who want to be more connected. Most Americans who visit Cuba end up feeling the same reciprocal desire to connect. To be ambassadors for a better aspect of America. After all, as any world traveler will tell you, we all have more in common than we have apart. All too often we allow trivial things like politics, religion, race and place of birth to separate us. Engagement leads to peace, understanding, respect and mutual benefit. President Obama realized the embargo was failing to achieve anything productive, and decided that if he could help expose the Cuban people to American culture, tourist dollars and information, he could achieve real progress. No doubt, the relationship to come will be fraught with stumbles, bumbles, squabbles and awkward moments, not terribly dissimilar to teenagers experiencing their first romantic relationship. The Obama administration has reestablished diplomatic relations with the Cuban government. They’ve reopened respective embassies and also made strides to relax travel restrictions and permit limited commercial transactions such as in the field of telecommunications so that the Cuban people can gain increased access to outside information via the Internet. After listening to the interview, I decided that Obama would really want to lift the book embargo if only someone would suggest it to him. After all, when you listen to his criteria for the modifications he’s made to date – providing Cubans access to more information via the Internet, more access to American Culture and business practices, doing things that directly benefit the Cuban people, sharing American cultural and humanitarian values – then it’s quite obvious that books could help him achieve his objectives. Books promote greater cross-cultural understanding and economic development. Books are the most powerful vehicle for knowledge sharing and free expression. Next week on March 17, according to Reuters, the Obama administration is expected to announce further easing of restrictions related to commercial and humanitarian assistance. Their announcement comes on the eve of President Obama’s visit to Cuba March 21-22. We want President Obama to address the book embargo in his March 17 announcement. With your help, this might be possible. In my opinion, the US economic embargo against Cuba is nothing short of a national embarrassment. It accomplished nothing other than harming the Cuban people. It’s anachronistic and antagonistic to basic humanitarian and American values. The American people seem to agree. According to a Pew poll last year, 72% of Americans now favor an end the US economic embargo against Cuba, including 59% of Republicans. Gallup has been tracking American sentiment toward Cuba and the embargo for many years, and their findings confirm the Pew finding. Most Cuban-Americans now support an end to the embargo. Only the US Congress has the power to completely abolish the embargo, and despite growing bipartisan support for the embargo’s end, it’s unlikely we’ll see the embargo lifted until after the next election in November. Two of the three Republican candidates for President – Ted Cruz and Marco Rubio – have spoken out against the end of the embargo. Ironically, their parents came from Cuba. To the young Cubans I spoke to, these two are a national embarrassment. But Cruz and Rubio come from a different generation, a generation whose parents fled Cuba in the '60s for political reasons. It’s this influential generation of Cuban-Americas that has made it politically impossible for rapprochement in the past. Though according to polls, even this older generation is slowly warming to the idea of normalized relations with Cuba. The more recent waves of Cuban immigrants coming to America since the 1980s have come for economic opportunity. These younger Cubans are much more in favor of normalized relations with Cuba, and much more in favor of ending the embargo. It's this new generation of politically influential Cuban-Americans that give American politicians the political cover they need to chart a new course. According to a December 2015 survey conducted by the research firm Bendixon and Amadi and referenced by the Miami Herald - 77% of Cuban-Americans age 18-49 support normalized relations between Cuba and the United States. Fully 53% of Cuban-Americans now support an end to the US embargo, and among 18-49 year olds, the percentage is 66%. Last year, Donald Trump went against his own party by expressing support for Obama’s efforts to normalize relations. Hillary Clinton and Bernie Sanders are also in favor of ending the embargo. One of these individuals is likely to become our next president. So while Congressional action is unlikely in the near term, President Obama has authority under the executive branch to make immediate modifications to the embargo. We think it’s time to add books to the list. In February 2016, a delegation of approximately 40 American publishing industry representatives met with their publishing counterparts in Havana, Cuba. The two days of meetings, held with the support of the Cuban government, represented an historic milestone. Its purpose was to build bridges of understanding and explore opportunities for greater cultural and economic collaboration. 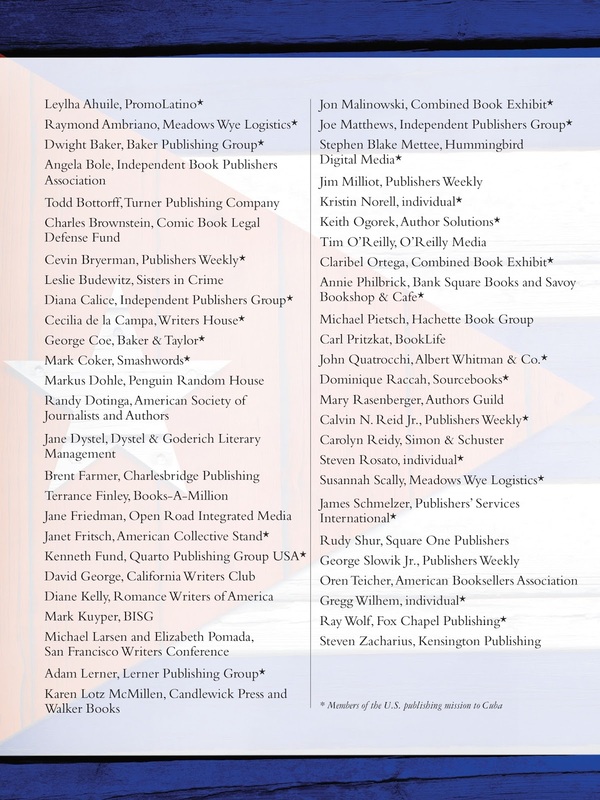 The undersigned companies and individuals - drawn from the American delegation as well as other leading U.S. publishing industry participants - hereby call upon the U.S. Congress and President Obama to lift the economic embargo against Cuba as it pertains to books and educational materials. This call is consistent with the will of the American people, who, according to a 2015 Gallup and Pew polls, overwhelmingly support the elimination of the U.S. trade embargo against Cuba. We ask Congress and the President to lift the US trade embargo against Cuba related to the production, distribution and sale of books and educational materials. The U.S. trade embargo is harmful to book culture and runs counter to American ideals of free expression. Books are catalysts for greater cross-cultural understanding, economic development, free expression, and positive social change. Cuba boasts a rich and proud literary tradition with much to contribute to book culture. Cuba's adult literacy rate-nearly 100%-is among the highest in the world. Exciting commercial opportunities exist for the American and Cuban publishing communities to collaborate for the benefit of readers and writers everywhere. 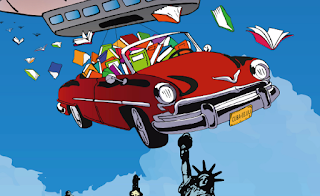 The American book publishing community stands ready to help Cuba's writers and publishers gain access to the global book market, and to help the Cuban people gain greater access to the amazing diversity of books published by American publishers. On the eve of his historic visit to Cuba March 21-22, we call on President Obama to utilize executive powers to immediately lift the economic embargo against Cuba as it pertains to books and educational materials. As a basic human right, readers everywhere deserve greater access to books and literature. Books promote cross-cultural understanding, economic development, free expression and positive social change. The book embargo runs counter to American ideals of free expression. Cuba's adult literacy rate – at nearly 100% - is among the highest in the world. Cuba boasts a rich literary heritage. End the embargo to make the works of American and Cuban writers more accessible to readers in each country. I disagree totally with your suggestions. Obama should never have even considered re-opening relations with Cuba. At least not until the Castro brothers are dead and buried. I respect your opinion, but I'm curious to learn your reasoning. The US stands virtually alone in maintaining such frozen relations with Cuba. Few Americans would disagree with the reforms Obama or even the Cuba-critics are asking for, but these are reforms we don't demand of other countries at the tip of an embargo's spear. Does it mean we should terminate diplomatic relations with China, Russia, Egypt, Saudi Arabia, Israel and dozens of other countries? The big question here is whether engagement is good for progress. Isn't our government imposing a double standard with Cuba? It's about time embargos against Cuba were ended. I'll add my name to the petition and will post links and information about ending the Cuban book embargo on my Smashwords Forum. 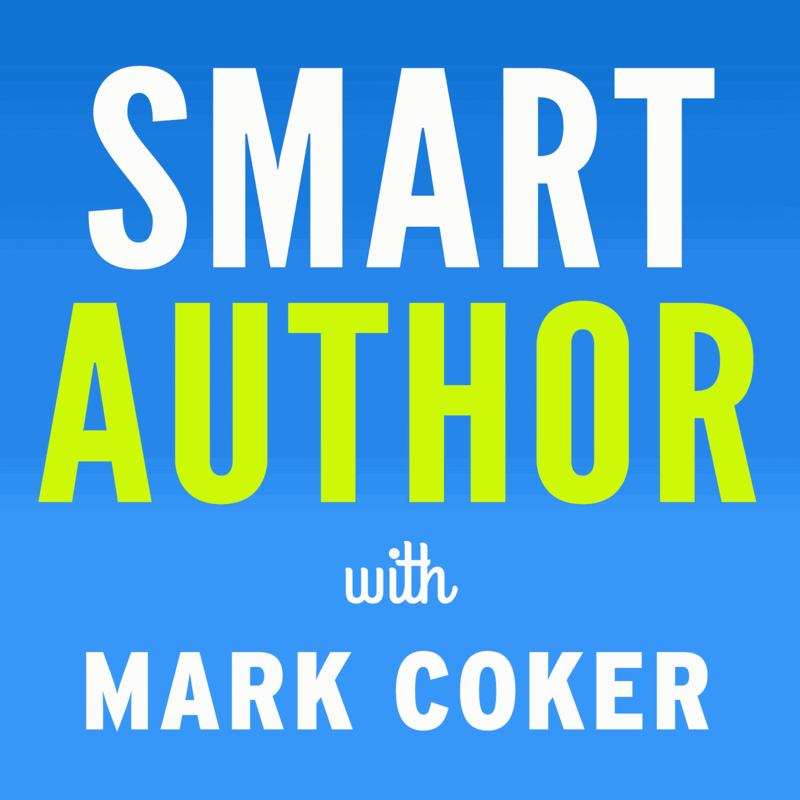 Thank you Mark for bringing this important matter to the attention of all Smashwords authors. Please note: Free membership required for access to all content created by our 1,000+ memebers and for posting questions/answers on our Smashwords Forum. Maybe I'm adamant about Cuba because I lived through the missile crisis, and Kennedy's betrayal during the Bay of Pigs fiasco. And I knew people who arrived in Florida after having escaped from the horrors inflicted by Castro. When you've heard young women talk about fleeing Cuba with their jewels secreted in body cavities, and you hear first-hand accounts of the atrocities committed by the Castro Brothers, it sets your opinions in concrete. Freedoms for the Cuban people, not their government. The Castro brothers and military will never allow the people free democratic processes. Any money flowing into Cuba right now with the ease of sanctions only lines the Castro's pockets. If they want something, they have to GIVE something, too. The US has made horrible deals in recent years that basically give out free money we don't have in the first place with no expectation of quid pro quo. There's a divide among Cubans - older Cubans that remember Cuba are against lifting any embargo, whereas the younger people that didn't live it want things easier for Cuban people. What those youngsters don't understand is the Castro brothers will never change. I respect your intentions, Mark, and I don't have a problem with the Cuban people having more access to literature - knowledge is power - but dealings with the Cuban Gov't have to be handled carefully and with strength. Hi K.C., thanks for the comment. I agree with you on a lot of points. I'm sure rapprochement will be messy and difficult. Both sides will need to work hard to find common ground without disrespecting the other. Long term, books can help bridge the cultural and political divides. I have been against the embargo for years. Nothing will do more to promote freedom and prosperity in Cuba than the free flow of information. I would love to see the Cubans have access to Time magazine and American newspapers. We need to get rid of the whole embargo. I am confident it will happen soon because it benefits no one. However, you forgot to mention that Cubans have little access to the Internet. Those that do, pay $2.00 an hour (Monthly wage is $20.00). Cubans will not be accessing Smashwords. While ending the embargo will allow Cuba to gain more access to US markets, it will do nothing to increase Cuban access to the World's "world of ideas" about freedom. The Arab Spring is currently impossible in Cuba due to the lack of access to the Internet and social media. Sorry but that is not entirely correct, in fact it is pointless guesstimating. Cuba has many good, solid and profitable book publishing companies. There is no shortage of paper or ink. What silliness is this; insisting that Cuba is a third world country simply to get a signature? Book publishers in the US simply want this highlighting ahead of the next visit by Barak Obama so that Amercian publishing companies can start to target Cuba and drain huge profits from them. That is their only goal. Thinking that they are suffering due to not having America as a market is both naive and ignorant. The guesstimate that a Cubans' average income is $20 a month is a completely pointless statement. The average pay is actually nearer to $30 a week but still that is a pointless statement as what it doesn't say is that this money goes almost as far as an American income. You conveniently missed out that the state subsidises the energy bills, education is totally free, unlike the American version, as is healthcare and food and alcohol is sold at cost or with tiny profit margins. They don't have vast sums of money to play with, don't have a lot of material wealth, but they do have many companies including book publishing that are providing what you claim is missing. The embargo is a typical toothless tiger that gives us in the US the foolish impression that we are doing something, anything, to suppress that calamity known as the Castro revolution. Its long existence in the books has done nothing to weaken the dictatorship and has given them the excuse they need to blame the Us for their shortcomings. Castro has not suffered a bit. The only effect, if any, has been against the people of Cuba themselves, most of whom were born after the revolution and have no blame for it. As a matter of fact, most of those responsible for that debacle are now in Miami enjoying our freedoms or retired collecting Social Security, Medicare and other capitalistic benefits while asking for more of the same. E-books in Cuba will not be available on the streets by the thousands anytime soon. It will take one at a time to do it. And it will require patience. Left the most important point out folks. Sorry. Just to say that I was born and grew up in Cuba, and opposed the vermin there and came to the US as an exile. 1. "On the eve of his historic visit to Cuba March 21-22, we call on President Obama to utilize executive powers to immediately lift the economic embargo against Cuba as it pertains to books and educational materials." Just another way for Obama to rule with executive actions and the communist government of Cuba to get stronger. There is no way I will sign this petition. 2. "As a basic human right, readers everywhere deserve greater access to books and literature." Access to reading material is NOT by itself a basic human right but part of the rights to life, liberty and the pursuit of happiness. These rights are granted by God and NOT by human governments. You want to ask the "king" (Obama) to grant these rights to the citizens (slaves) of another country? 3. "Books promote cross-cultural understanding, economic development, free expression and positive social change." Sounds nice, doesn't it? But not always true and not a reason to to support suppressive governments and thus continue keeping their "citizens" under the knee of the "state". Do you remember "Mein Kampf"? How about the Koran? 4. "The book embargo runs counter to American ideals of free expression." American ideals of free expression are "AMERICAN" and don't pertain to FORCING US to support repressive foreign governments. 5. "Cuba's adult literacy rate -- at nearly 100% -- is among the highest in the world. Cuba boasts a rich literary heritage." And?......We should support their jack-booted regime so they can have more books to read? That is love for others? 6. "End the embargo to make the works of American and Cuban writers more accessible to readers in each country." Ending the embargo is just another way of promoting the life-destroying anti-human rights Cuban regime. Oh, yes, give the people more books - but no more liberties. 7. "72% of Americans support an end to the trade embargo against Cuba (Pew, 2015)"
underlying giving in to the communist regimes of the world. It has nothing to do with my compassion for the plight of the Cuban people - and this petition will do NOTHING to change that - it only supports Obama's belief that he can make any rules he wants and the people must obey - and, well, the Castros already know that. "Of the approximate 45 publishers in Cuba – all state sponsored and cash-starved – they don’t have access to US markets, or to the services and expertise of the American publishing community." So all of the publishers in Cuba are run/controlled by the Cuban government, none are allowed to operate freely, and that's the fault of the U.S. embargo? These Cuban government-controlled publishers are "cash-starved" and that too is the fault of the U.S. embargo instead of the Cuban government which is not giving them the resources they need? We here in the U.S. get most of our writing materials and the computers we use for writing from China, but Cubans can't get them because of the U.S. embargo? There are tremendous resources for authors available online but Cuban authors don't have access to many of them because the Internet in Cuba is expensive and censored, but that too is the fault of the embargo? And let's not forget that the Cuban economy which is in shambles, that too was primarily caused by the embargo of a neighboring country rather than the countries own oppressive, communist economic policies? Obviously the U.S. embargo of Cuba has had an impact on Cuban authors and literature, but let's not be ridiculous about the affects of the embargo when compared with the devistating effects of the Cuban government's oppression of free speech and free markets. Internet access is heavily regulated inside Cuba. So, the chances of the regular Cuban Joe/Jane getting access to anything published in Smashwords.com or any other distributor are nil. Even if limited access is granted, everything will be heavily censored once inside. Yes, there may be an embargo, but the biggest embargo is the one inside Cuba from the Castro regime. I am a Cuban-American, and I think the embargo should go away. But not because it's not fair, or any such other Pollyanna attitude--but simply because the Castro regimes uses that as propaganda tool to say that things are bad in Cuba because of the embargo. That's BS--things are bad in Cuba because Cuba is the Castro Brother's private plantation, their own little island. The embargo has never worked anyway. I won't sign it simply because it's a naive waste of time. @Michael Sanches - yes, access to the Internet is a big challenge, though the Cubans I spoke with said they're starting to see more of it now in different parts of the county. It's also becoming more common at universities where I'm told it's free. There's still much progress to be made here but these are signs of progress nevertheless. In addition to lack of access, the access is often at very low speeds. One author told me it took him nearly an hour to download the Smashwords Style Guide. Re: access to the world of ideas about freedom, check this out... A Cuban government publisher will be publishing Orwell's 1984. Orwell's 1984 to be Published in Cuba. @John - The Cubans reported this directly to us. The embargo makes it much more expensive for them to secure supplies of paper and ink. Anything that increases the cost of producing books decreases the availability of books. That's my point. If the embargo is lifted, their production costs will decline. You wrote, "Book publishers in the US simply want this highlight[ed] ahead of the next visit by Bara[c]k Obama so that Amerc[an] publishing companies can start to target Cuba and drain huge profits from them. That is their only goal." ^^ That's a wonderfully sinister conspiracy theory, but it's not true. I think all of my fellow delegates realize the profit opportunity for American publishers (or distributors like Smashwords) is neglible in the intermediate term and minimal to modest in the long term. Why then are so many American publishing companies so enthusiastic about helping Cuba? Based on my experience working in this industry for eight years now, I can tell you that most people who get into publishing are in it for the love of books, and the belief in the transformative power of books. If profit was their primary motive, they would have gone into investment banking. What I heard over and over again from my fellow delegates was a desire to help the Cuban people, and a desire to help the Cuban publishers. And speaking for myself and Smashwords, I look at the economic challenges faced by Cuban publishers and writers alike and see that our free publishing and distribution services are ideally suited to their needs because we make ebook production and distribution accessible to anyone at no cost. It's exciting to me that we have the opportunity to give every single writer and publisher the opportunity to get their works in front of readers. If my motivation was profit, I have much more lucrative and immediate low-hanging fruit all around me. I support this effort because it's the right thing to do. @edwinstark See the news above about the publication of 1984. If the Cuban government wanted to prevent the publication of books dangerous to their ideology, then why would a government publisher publish 1984 from Orwell - a noted anti-communist writer - a book that's all about exposing the dark side of authoritarian and communist rule? I'm not saying Cuba is going to swing their doors wide open overnight to anything and everything, but these are signs of progress. The Cuban government sanctioned our visit. If you have ideas of how to prompt positive progress, please share them here so people can benefit from your ideas. @Dr. Montesino, thanks for sharing your perspective and support. It's a common tactic of those in political power to try to deflect blame for this and that on external boogeymen, both real and imagined. American politicians often play this card as well. So I agree, the end to the embargo will force the Castro regime to be held more fully accountable to its own people. @NancyLEE Wow. You hate President Obama, you hate the Castros, and you hate communism. But what's the harm in making more books more accessible to the Cuban people? Books are vehicles of free expression. Books give people ideas, knowledge and power. Information is what powers positive social change. @pdstein. No, it is not the direct fault of the embargo that Cuban publishers are cash starved. It's more complex than that. Their entire economy is cash starved, and I'm sure the blame for that can be spread quite liberally to many circumstances of the government's own making in addition to the embargo. The point is that Cuban businesses are resource constrained, just like any other business anywhere else. But if you're running an American business, imagine how disruptive it would be if you were not allowed to do business with any company in China or Germany. That level of blockade doesn't prevent you from doing business, but it limits your flexibility and raises your costs of operation. When costs increase your ability to sustain your business decreases. That's all. @vivienne Exercising free expression is never a waste of time. :) Most important social, economic and political advances throughout history were precipitated by people standing up and voicing their opinion. This petition is just one of many small steps aligned with the wishes of many millions of people. And thanks to the media coverage and social media discussion around this petition, hundreds of thousands of people have been directly and indirectly exposed to these ideas. I noticed a tweet this morning from a petition supporter that summed everything up quite nicely in three simple words: "Books help. Period." There is no US embargo against books and publications of any kind being sent to Cuba. There is a Cuban regime embargo on American publications due to censorship. I do not hate Obama, the Castros or communism. No where is the word hate mentioned in my comment. I value liberty and as such, do not want to live under a monarchy or dictatorship where one man can spit out executive orders whenever he pleases to implement whatever he pleases. I also won't support other regimes that suppress others people's liberties. In fact, I almost just deleted the email outlining this petition until I read you asking the president to invoke executive action to lift this embargo. And I addressed each of your suggestions but did not say "Wow! You hate the principles of liberty." Because I don't know if you actually hate these principles or if you just don't understand. I have read a lot about the devastating economic impact of the embargo, but i could never find an independent assessment of it. After researching it for months, I decided to do it myself. I published my book Cuba Under Embargo, including on Smashwords, to share my findings. At a macro-economic (or aggregate) level, its impact was virtually zero. That implies the condition of the Cuban economy is a result of the regime's political choices. I totally agree with Vivían and other comments above. I was born and raised in Cuba. I know the country, the goverment,the way things operate in my country because I lived there. The only reason you weRE allowed to visit Cuba is because of your precious dollars that Castro covets so much. Tourism is the main gate to access to the mighty dollar. Did you notice that Cuban peso, the national currency has no value anywhere outside Cuba? You cannot purchase any item by using cuban currency. My people love to read and write. That is correct. It is also truth that everything is heavily regulated, censured and penalized by the Castro regimen. You may ask me privately. I could tell you all about the punishments inflicted on Cubans who try to express their opposition to Castro's dictatorship. That translates into a very simple fact: Cubans have no freedom. All human rights have been snatched from them, including the right to read and write whatever they desire. You visited my country but you were never left out of the government's sight. You did not have the freedom to visit and chat with cubans without being monitored. And if by any chance, a Cuban could speak te a te with you he or she would know better than complain about the mysery, the abject poverty , the lack of everything in my countrY including freedom. You are correct. Whether you are a doctor or a garbage collector, your income is miserly. You don't have access to the most basic articles, including food and medicines. They know the lethal consequences should they desire to comment about life in CUba with a foreigner. All Communist countries share one thing in common; human rights do not exist for them. Communism equals dictatorship. Should you were Cuban,and reside in my country you would have never been able to found Smashwords. The embargo is not the reason why my country has been enslaved and impoverished to the extreme is so prevalent today. No. It is the people on power, the iron hand of its Communists leaders what have taken my country to the paleolithic Era. Cuba: The country you have never seen. This is a loose translation because the actual book will be written in Spanish. It is my desire to expose the reality of my people, the one that is silenced by the dictatorship that governs every aspect of their lives. Las Damas de Blanco , the White Ladies. They represent the opposotion. Their husbands are incarcerated for expressing their desire to be granted the human rights taken away from them. You are not in the business of politics but I guarantee you that if you try to meet with any member of the Opposition that meeting will never come to fruition. I am not an outsider.I lived there.I escaped. I know that as long as there is not a democratic goverment in the island, my.people will continue to be puppets, marionettes skilfully manipulated to enrich the goverment. Abolishing the embargo would make no difference to Cuban people. It will only enrich and perpetuate the establishment of communism. Thank you Mercedes Kim - for saying the truth about Cuba, your concern for those still enslaved under that regime, and for your kindness to Mark in your correction of his beliefs. @Mercedes Kim, thank you for sharing your detailed analysis and perspective. You've added much to the conversation. I'm interested to hear all sides, especially from Cubans so thank you. @NancyLEE, I'll take your word and stand corrected that you don't hate Obama, the Castros and Communism. You threw me off with your comments. You referenced Obama as a king and basically implied he's an authoritarian rogue when in fact he's the democratically elected president using executive powers as is his right. He doesn't have many other cards to play. The congressional leadership has made it their stated goal for 7 years to obstruct everything he does. Americans put him in power and reelected him. If Americans want a new direction, they have that choice in November. Our campaign is arguing that democratized access to books will enable greater cross-cultural understanding, yet somehow you linked this idea to oppression, Mein Kampf and the Koran (?). You referred to the Castros as a jack-booted regime which might imply extreme dislike bordering on hate. Regardless, I think we have a fundamental disagreement on one key point. I think democratized access to books in both direction can bring mutual benefits without propping up the regime. You appear to believe that any form of cooperation with Cuba props up the regime. I don't understand how the free expression and knowledge found in books would prop up the current regime. In fact, it's probably the opposite. Information is power. You are correct. Information is power. That is exactly the reason why Cubans do not and will have not access to any books that might in the slightly open the eyes of the yoUnger generations about the possibility of change,of new winds,ideologies, anything that might open the doors to seek freedom from oppression. You can bet your mighty Dollars that such an exchange of new possibilities or avenues to the outside world would be crushed before you can suggest them. The control of the goverment over the Citizens is so tight that there is not a small crack to go unnoticed. I spent all my infancy visiting Cuban jails, all over the country. My father was incarcerated along with his peers who tried to bring down communism. I know all toO well about the executions of those who dissented with the government. The reason why, you cannot travel around the world if you desire so. If you leave the country, you cannot come back.in the last yeas, there has been a slight change in this policy. Some cubans are allowed to visit their relatives in the US because their trips generate the infux of dollars that Castro needs desperstely, especially after the fall of communism in estearn Europe. It is the reason why there are not privaTe businesses or properties owned by Cuban citizens. The reason why I received Catechism.instruction privately at home . The rEason why my catholic practicing friend in mediCal school was expelled from the university although he was the most brilliant mind in my class. No freedom of speech, religion, or any other fundamental right has been honored in the last 57 years in my country. Your enterprise will prop the goverment Because the goverment will seize all earnings from sales. The free interchange of books shall it takes place will be used to "export communist propaganda"
By the same token, the books that cubans will be allowed to receive even in a free download format will be either innocuous in content or will reinforce the political agenda of the goverment . As I mentioned before, Cubans have no access to any foreign currency. How do you expect them to have the freedom to purchase any book of their choices? If you desire to gift any citizen of your choice With any amount of dollars they will be seized inmediately or they will be exchanged for some "chavitos" , a special sort of chips that Cubans aRE allowed to possess to purchaSe in special stores when their relatives from the US send them money. In other words, I can send my familt let's say $300.00 next month. Upon receipt of those dollars the family has to exchange them for chavitos. My family cannot keep the dollars because it goes against the law. The articles they are allowed to purcha Se in those special stores are highly overpriced. In a nutshell, who is in reality benefiting from the money we send from the US to our relatives in Cuba? Who will benefit from your enterprise shall it will materialize ? How many Cubans will be able to use the most coveted money assistance from their relatives in exile to purchase books when they are all hungry and in deep need of basic articles? I hope by now, you do have a clearer vision about what it entails to deal with a Communist goverment, especifically, the one that reigns in my country. There will be only one stratus of society that will benefit from this commercial interchange. I apologize for grammatical errors in my latest comment. Mark, you seem to be terribly misinformed about the current administration. Yes, Obama was elected by the low-information voters (read: dumb masses). NO, he has not been seriously opposed by anyone. The Republicans have been given control of both houses of congress for one reason only: because they promised to stop his excesses of power and reverse the atrocities he has committed. Instead, they've acted as his handmaidens and given him very nearly everything he's asked for - all of it to the extreme detriment of this country. YOu can take this to the bank: if Obama is FOR opening up Cuba, then it won't be good for America in any way, shape, or form. I signed the petition, from a different email address, thank you for that opportunity. kudos to you - I don't really believe in petitioning government officials unless I know them personally and then I prefer to do it one on one when possible. but I truly hope the dude in the White House listens to reason, for a change. I published two novels by a Ukrainian diplomat, Vasyl Baziv, who was one of the key players in the Maidan Revolution, “The Cross” and “Armageddon at Maidan” with my Anaphora Literary Press. According to the Ukrainian cultural administration agency, these are the only two novels ever published in America by any Ukrainian. Is there an embargo on Ukrainian books too? I mean, how would I find out if there was one? Would I get a ticket or would the shipment of books be blocked and confiscated? And What if the books are printed in the UK vs. the US, is there an embargo on me creating books by Cuban writers or on shipping books to people or bookstores in Cuba, or is it on printing books in Cuba? I’m very confused. I tried to find the exact working of the law on this topic, an extremely confusing letter on the federal government’s website that explained extremely nuanced situations like what is “peer review” instead of just saying what I can or cannot do with regard to publishing in Cuba or works by Cubans. And if the problem is that Cuba is (or was) a totalitarian, communist dictatorship, wouldn’t the main way to help the “Cuban people” be by helping to disseminate writings that are critical of the regime, or writing and reading in general? Clearly, making laws that prevent me from publishing anybody from a specific country prevents me from practicing my freedom of the free press and the author’s freedom of speech. There are probably more than 20,000 wrongly convicted prisoners in the US today that were convicted without a fair hearing or evidence against them, so can the US really judge who Cuba is sending to prison? When I worked in China as an Associate Professor at Shantou University, I could not find any of the US/UK published titles that had “printed in China” stamped on their copyrights pages because of bans on content not produced in China there. What’s the difference between that and banning the book trade with Cuba? Publishing is done electronically today and half of a company might be in India, so can the whole corporation be prevented from trading with Cuba when it has branches in countries without a Cuban embargo? Recently, a university library in North Korea bought 50 of my EBSCO ebook titles because at $2.99, they are a lot less than the average academic book priced at $45. So, I’m pretty sure having access to cheap ebooks is especially significant with countries with a low per capita income like Cuba. Denying researchers in Cuba access to cheap US books is like denying hungry people there access to food that’s equivalently cheaper. I hope that books, journals and newspapers will officially be excluded from the Cuban and all other national embargos, and if these laws persist, I hope somebody from the US federal government will send an email to me explaining exactly who I cannot publish, or where I cannot print, or where to I cannot ship, etc. Etienne, at the risk of going off topic, if you want to believe I'm misinformed, so be it. There has been a systematic misinformation campaign to delegitimize President Obama ever since he was elected. The "low information voter" tactic you're using is one such example. LIV is a red herring IMHO because it doesn't address accuracy of the voter's beliefs. If voters are opposed to Obama's Cuba policy for fact-based reasons and honest differences of opinion on approach, then I'm totally cool with that. I've read some persuasive arguments on this thread in opposition to normalizing Cuba relations. I respect these arguments. I hope Obama listens to his critics. You appear to be opposed to anything Obama does. That's your right. A lot of Obama opposition in the current political environment is based on misinformation. By way of example, 43% of Republicans still believe Obama is a Muslim (false). Only 29% of Republicans believe Obama born in the US (44% said he wasn't and 29% weren't sure) according to PPP. In the same survey, more Republicans believe Ted Cruz was born in the US (40%) than Obama's 29%, even though Ted Cruz *was* born in Canada and Obama was born in Hawaii. Some people are choosing to remain willfully ignorant of the facts. The primary booster of the birther movement is now the Republican front-runner for president. If we look at the economy, the same misinformation runs rampant as Obama's opponents try to claim he has destroyed our economy and ballooned the deficit (false, the economy has grown and the deficit has shrunk during his administration). These misinformation campaigns can lead to a misinformed electorate. In a November poll by Bloomberg News, 53% of Republicans said the unemployment rate has gone up since Obama first took office in 2009 (false - the only correct answer is that unemployment has dropped significantly). No doubt, there are misinformed voters in both parties. Some Dems got these questions wrong as well, though not by such a margin. May the most informed voters prevail in November. Spoken like a liberal Kool-Aid drinker. FYI the National debt has very nearly doubled to 19 Trillion dollars since Obama took office. Every thing you've cited can be disproven by simple fact-checking. And we are getting way off topic here. But as you note, Cuba has achieved the perfect communism where everyone is equal. Of course as usual it is equally poor, but still it is pretty much perfect, isn't it? So why would we want to mess with perfection? I am stunned that Smashwords is on a communist support campaign. We should have never changed our stance toward those murderous, communist bastards in Cuba. I will NOT be supporting this effort. Another example of short sighted personal financial goals put ahead of National security. I understand what you are trying to do, to help open up Cuba to the outside world, but I cannot support this effort. Cuba will sell you all the books you want (if you read Spanish), but the Cuban government has and will continue to pick and choose what books will be sold in Cuba. Until they allow unrestricted sales of books without government censorship, then this effort to encourage freedom of speech is a waste. The unemployment rate goes down because those no longer looking for a job through the Unemployment Offices are no longer counted. The stats are only taken from the numbers that go through the Unemployment Offices in each state. It doesn't count those who find jobs outside of it because they never qualified for unemployment benefits enough to bother going in. It doesn't count those who have given up and stay home. It doesn't count those who gave up and live on welfare now. It doesn't count those who try to make a living with temp jobs and side jobs. So the rates the Gov't Unemployment Offices release are stats that are pointless and can never be trusted because they only truly represent a small section of the US population. Dos amigos desde Miami se van este jueves a la capital cubana porque allí, comenzará en La Habana la Feria Internacional del Libro 2016, que será inaugurada con la presencia del vicepresidente uruguayo, Raúl Sendic, de visita oficial en Cuba. Sendic lidera una delegación que incluye a los ministros de Economía Danilo Astori y de Educación y Cultura, María Julia Muñoz, entre otras personalidades invitadas a la cita literaria. La edición 25 de la Feria del Libro tendrá participantes de 37 países y llevará a las librerías cubanas más de 900 títulos -replicados en unos 3,6 millones de ejemplares-, entre ellos 31 textos de autores uruguayos. Desde Uruguay también llegarán artistas y conjuntos como el Grupo Folclórico Nacional, que actuará en la ceremonia de apertura, y el reconocido guitarrista Daniel Viglietti, que rendirá tributo al poeta uruguayo Mario Benedetti con un concierto en la Casa de las Américas de La Habana. El pabellón "Eduardo Galeano" en la Fortaleza San Carlos de La Cabaña será el lugar para apreciar una muestra de la literatura y el arte de la nación suramericana. La XXV Feria del Libro se celebrará del 11 al 21 de febrero en La Habana y tendrá como sede principal a La Cabaña, recinto militar convertido en museo, para luego extenderse gradualmente por todo el territorio nacional. Como parte de la sesión profesional, tendrá lugar en La Cabaña el Encuentro de Editores Cuba-EE.UU., que analizará temáticas relacionadas con el mercado del libro en los dos países, que actualmente trabajan en la normalización de sus relaciones. 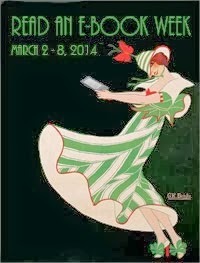 La Feria Internacional del Libro de Miami está considerada como la reunión literaria más grande y mejor de los Estados Unidos. Es el evento estelar del Centro Literario del Miami Dade College. Por primera vez en más de 50 años se venden libros cubanos en Miami editados en la isla, también videos y discos de música en una clara demostración que los tiempos que vivimos son de cambios. Este acontecimiento tiene lugar en la Feria Internacional del libro de Miami. El publico disfruta de más de 200 expositores de todo EE.UU y otras partes del mundo, pero la noticia es Cuba en una atmósfera festiva, de lecturas y conversatorios. ¿Quién se lo iba a imaginar? Pero es mejor que vea esta entrevista hecha por Hermes América en plena Feria Internacional de Miami acompañada de varias fotos. Desde Miami, vale la pena hablar del tema, que aquí eufemísticamente, llaman embargo pero que realmente es UN BLOQUEO . Este 13 de agosto Fidel Castro cumple 90 años, buscando en los discursos del líder histórico de la revolución cubana, nos encontramos cualquier cantidad de textos que fueron dichos para leerlos hoy y mañana, entre ellos el tema del bloqueo de Estados Unidos a Cuba, tan absurdo mecanismo que hasta el propio presidente Obama crítica y pide al congreso de este país que termine ya. "Para comprar medicamentos hace falta dinero y el bloqueo tiende a privar a Cuba de toda posibilidad de contar con recursos económicos para comprar los medicamentos. El bloqueo no es simplemente la prohibición de las ventas, es la prohibición de las exportaciones del país para privarlo del recurso económico con qué adquirir las cosas esenciales, suponiendo que hubiera un país que aceptara comprar medicamentos y con el medicamento los inspectores para ver en qué se iba a usar. Es una cosa absurda, loca; es cínica, verdaderamente cínica. Después añadir que no, que los medicamentos no están incluidos en el bloqueo. El bloqueo es mucho más duro, el bloqueo no ha sido simplemente las regulaciones; el bloqueo es una persecución tenaz, incesante, contra toda operación comercial que Cuba realice en cualquier parte del mundo. Cuba produce níquel, tiene de las más grandes reservas del mundo de níquel, una producción relativamente importante de níquel; pero es muy difícil vender el níquel; no en Estados Unidos, sino en Japón, en Europa, en cualquier parte. ¿Por qué? Porque Estados Unidos prohibe las importaciones de equipos o de aceros construidos con níquel cubano. Figúrense, muchas de las principales fábricas productoras de maquinarias tienen deseos de exportar a Estados Unidos equipos fabricados con determinados aceros, y, al prohibirles que contengan níquel cubano, es muy difícil para Cuba vender el níquel. Pero ellos persiguen rigurosamente cada operación comercial con este país, y hoy día todo el aparato gubernamental de Estados Unidos y todas las embajadas de Estados Unidos en el mundo se dedican a perseguir las operaciones comerciales de Cuba con el extranjero. ¡Es increíble!, pareciera que las embajadas de Estados Unidos no se ocupara de otra cosa más importante que no sea esa. Esta situación es más grave después que desaparecen la URSS y el campo socialista. Entonces todos los recursos, todos los medios, todos los aparatos que se dedicaban a combatir a la URSS, a combatir el campo socialista, que se dedicaban antes a combatir también a China y a otros países, todos esos recursos, todo ese inmenso, gigantesco aparato, se concentra en un solo país: en Cuba. De modo que Cuba, vecino pequeño aquí, al lado de Estados Unidos, hoy tiene que soportar todo el peso de esa hostilidad concentrada en un solo país. Lo que antes se dedicaba a combatir países que sumaban más de mil millones de habitantes, hoy se dedica a combatir a un poquito más de 10 y medio millones de habitantes. Es el país en el mundo que tiene más hostilidad per cápita, más dinero per cápita para combatirlo, más recurso per cápita en la campaña de hostilidad y de agresiones. Si cualquier empresario de cualquier parte del mundo quiere hacer una empresa mixta en Cuba, o alguna operación de algún tipo —comercial o financiera—, o alguna inversión, muchas veces el embajador norteamericano lo llama por teléfono y se reúne con él para presionarlo y para persuadirlo de que no haga la operación con Cuba; para amenazarle, para presionarlo diciéndole que después no podrá hacer negocios en Estados Unidos. Figúrense, tratándose de un país tan poderoso, tan rico, de un mercado tan grande, con la cantidad de tecnología que tiene Estados Unidos, de cada 10 personas que quieren hacer operaciones con Cuba, 9 tienen que desistir de hacer las operaciones, por lo menos 9 de cada 10. Siempre vienen de buena fe —como regla— estos industriales, hombres de negocios, que visitan a Cuba. En Cuba se les deci: "No hablen, no le den divulgación a lo que están haciendo." Porque a veces, por su buena fe, creen que es lo más legal del mundo, lo más moral del mundo y lo publican; inmediatamente detrás viene la embajada norteamericana a presionarlos; y en reiteradas ocasiones se enteran aunque no lo publiquen, ya que tienen espías en todas partes. El bloqueo es algo más que prohibir la venta de mercancías de Estados Unidos, impedir comprar o vender en Estados Unidos, es una feroz presión y una feroz persecución para evitar que Cuba haga operaciones comerciales de ningún tipo, y todo ese poderío inmenso está concentrado hoy contra un solo país", hoy en día . Obviously we U.S book distributors and publishers are not into this for our own HEALTH nor for a "cause". We (alll of us) are looking into Cuba and doing this to make money for ourself out of this for a PROFIT ! ! ! ......and to have more control and be the first ones in. We are not an ONG. We are all FOR PROFIT here looking what we could sell in or to Cuba and take the cash ($$) back with us and spend it Cuba. Not to leave it there and help from real "People to People". That is just an excuse for all of you US publishers and distributors to make more money somewhere else were they think there is a Nitch . Why don't you import communist and socialist books into the U.S. ?......the other way around ! This "Intercultural Exchange" BS is or should be a "two way" highway . From here to there and from there to here, equally. It is not really a "cultural exchange" B.S. ; it is the new substitute to the "Cold War" ; its a new War of "low intensity" through books, music and culture. Don't you think they know already ???? You are all entering SUTTLE into the WOLF's big mouth ! Instead of reaching out and trying to work and make ends meet directly with the Cuban publishers and/or government agencies , you may or should ONLY focus and reach out to Independent Cuban authors whom are not part of nor have any ties or relation with any Cuban publishers . And should NOT be aided by the INSTITUTO CUBANO DEL LIBRO nor any other Cuban publishers to help you lounge your so called "freedom project" ; as this defeats the real purpose . Raul Castro recently opened an entrepreneur loophole named ; "CUENTAPROPISTAS" which more or less translates or means "self employed" ; such as taxi drivers, barbers, etc. Having that said, writers, authors and musicians are also "CUENTAPROPISTAS " and can and should be reached out directly and individually and not via or through the means of the help and aid of the very Cuban Regime agencies whom sponsor Smashwords and their US crew to come down into their headquarters and conduct their events and conferences which you all engage in and participate in and do in Cuba at the Feria Internacional del Libro. Rather you should stay away from them (the Cuban publishing given ment agencies) as they are or would be your own competitors , at the end of the day; since all they are really doing is their own "counter intelligence" diligence against all of you. Not everything that shines is GOLD ! Should I say; "your barking up the wrong tree" !!!! Hasta la proxima y "Bon boyage"